Last year, tourism in England contributed £106bn to the British economy (Visit England). In light of these promising figures it’s not surprising that local councils are looking for new and innovative ways to improve the tourist experience. In recent years we have seen travel and tourism leap into the digital world, driven by the consumer trend for more immersive experiences (Booking.com; 2017). 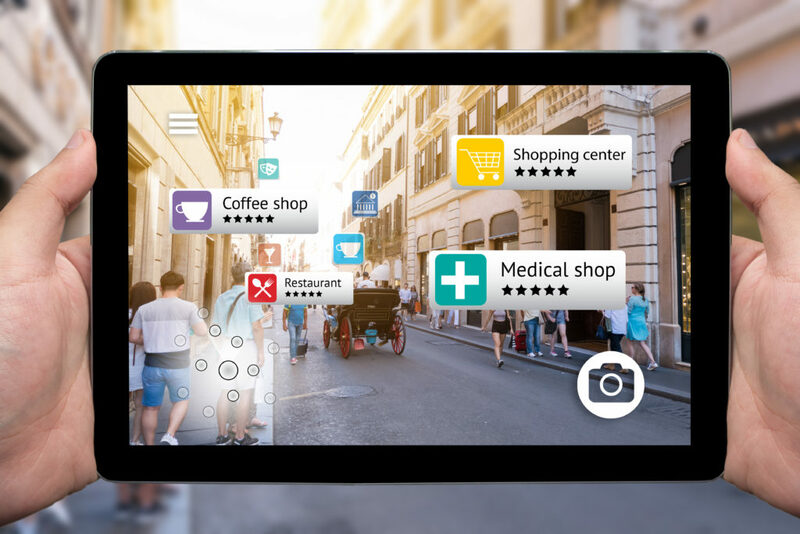 With travellers now looking to technology to find out more about a destination, we consider how augmented reality could help councils to attract visitors and support the economic growth of a town or city. Augmented reality is still a relatively new technology and its application to different industries continues to evolve. Unlike virtual reality, where people can explore and interact in a virtual world, augmented reality enhances the real world with digital information. In terms of tourism, augmented reality can be used to enhance the local experience. The technology adds value by providing more, in depth information on attractions and local businesses. In our experience, augmented reality for tourism works well when built into a visitor app. Acting as a digital guide, visitors can simply point their phone down a street, at a poster or at an information sign and the augmented reality feature will provide them with real-time information for points of interest, attractions and amenities. But how does it actually work? Councils begin by choosing which sites or locations they want to ‘tag’ with information. We call this ‘geotagging’ which means taking a photo and embedding location information. The augmented reality function on the visitor app then uses image recognition and location sensing to prompt the release of information when the smartphone camera is pointed at the ‘tagged’ site, which people can view on their screen. This could be virtual arrows or signs pointing to businesses on a high street or a pop-up overlay when people get near to an attraction. Geotagging can be used on posters or visitor information signs and can include clickable links to booking information or details and guidance to nearby points of interest. Councils can also build on the offering for existing tourist experiences, using augmented reality to bring local history to life. The Virtual Romans Project, a collaboration between De Montfort University, Jewry Wall Museum, and the University of Leicester produced a multimedia recreation of Roman Leicester from around 210AD. The project used augmented reality, as part of an app, to showcase 3D interactive models of artefacts, Roman buildings and archaeological finds discovered in specific areas of Leicester, layered on top of the city’s modern landscape. By adding value and widening the appeal of an established experience, local authorities could diversify its visitor offering and create attractions that are inclusive for everyone. Though the technology may seem complex, the actual function makes navigating a new town or city simpler and more enjoyable for visitors. Augmented reality for tourism is about giving people more information, removing the need to search lots of visitor sites, and providing an interactive way of feeding people round the streets. The tailored information makes it easier for people to explore a new location and done well, could mean they will stay longer and spend more in the local economy. As added value for both travellers and the local authority, augmented reality can help to guide people to lesser known attractions, perhaps one that is off the beaten track or a hidden gem that people will enjoy telling their friends about. Augmented reality has inspired many industries to find new ways to communicate and provide services to consumers. For local tourism, the possibilities are endless. From appliance information in an Airbnb, 3D images of a meals on a restaurant menu to a virtual tour guide after you step off a train in a new city, technology is making the visitor experience even better. We see augmented reality as a key element of 21st Century tourism, providing immersive experiences that can help to build the reputation of a town or city as an exciting place to visit. Investment in this technology, to support tourism, could come from individual businesses looking to boost their individual offerings. However, councils may look to provide augmented reality within a mobile travel guide or visitor app, as part of an overall growth strategy.